Photo: Anderson Smith2010. Creative Commons BY (cropped). The “Amazon” of the ocean is a massive series of interconnected reefs in the western equatorial Pacific that covers six million square kilometres and is home to three-quarters of all coral species. It’s known as the Coral Triangle and chances are that you might never have heard of it. Which is surprising when you find out nearly ten percent of the global fish supply comes from this bioregion, that more reef species live here than anywhere else on the planet — including six of our seven turtle species. And much of this mother lode of oceanic biodiversity is highly endangered or about to be. Which should be headline-grabbing news when you consider that forty percent of the world’s economy along with eighty percent of the needs of the poor come from biodiversity. So how can we be largely unaware that such an important piece of the earth’s ecological puzzle — two-thirds the size of the continental US — is disappearing? The Coral Triangle connects six countries: Indonesia, the Philippines, the Solomon Islands, Malaysia, Papua New Guinea and Timor Leste. Three hundred and sixty three million people live here. For one hundred and twenty million of them fish is their main source of protein. In Ghizo, Solomon Islands, USAID is working with the government and communities to set up protected areas that are effective and consider biodiversity, climate change and social concerns of the community. Photo: USAID CTSP/James Morgan. Creative Commons BY-NC (cropped). But the Coral Triangle also has many fish hungry neighbours. For example, diners in Hong Kong like to choose from live fish swimming in tanks for their dining pleasure. Coral Triangle fishers service this predilection using quick bursts of potassium cyanide to paralyze fish, which are scooped easily out of the water, and flown to waiting customers. Add to that Asia’s voracious appetite for shark fin soup means many reefs in the area are now devoid of these apex predators — a detriment to reef health. Then there’s ocean acidification because of increasing amounts of atmospheric CO2 oceans are absorbing. The lower ph means all these precious coral species can’t rebuild themselves. 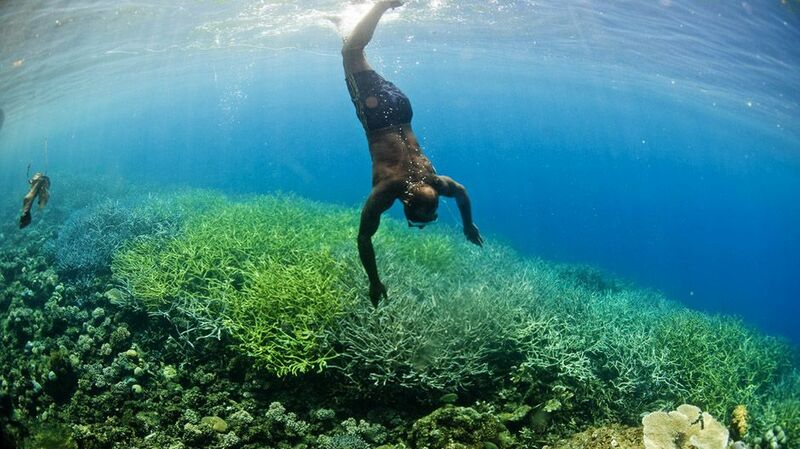 Additionally as oceans heat up corals expel their nutrient providing algae and coral bleaching ensues. Scenarios such as this are being repeated the world over — marine habitat degradation and the over exploitation of fish stocks. For the most part, it all occurs underwater — out of sight and out of mind. Compare it to the rapid pace of the terrestrial Amazon forest mow-down in Brazil — visible with a few clicks on Google Earth. Satellite imagery starkly reveals that beneath plumes of forest-clearing smoke, twenty percent of the Amazon has disappeared. Dr. Paul Barber, a University of California, Los Angeles, ecologist and evolutionary biologist, says the problem is compounded because while Indonesia is the geographic centre of the triangle and made up of 17,000 islands, very few Indonesians swim — even fewer scuba-dive. Which means the damage from reckless fishing tactics such as cyanide poisoning or dynamite fishing — which blasts two hundred square foot square holes in reefs — is not witnessed by its practitioners as they net only desirable species of fish floating at the surface. Five years ago Dr. Barber helped establish the Indonesian Biodiversity Research Center. Four years of genetic-sequencing research at IBRC is helping the Indonesian government protect remaining shark species. A step in the right direction for a nation that satisfies most the world’s shark fin demand. Indonesia is also experiencing positive results from its Marine Protected Areas (MPAs) — think of these as a National Park designation for the oceans. Beyond replenishing fish numbers and increasing food security, MPAs earn revenue from high-end dive and eco tourism. 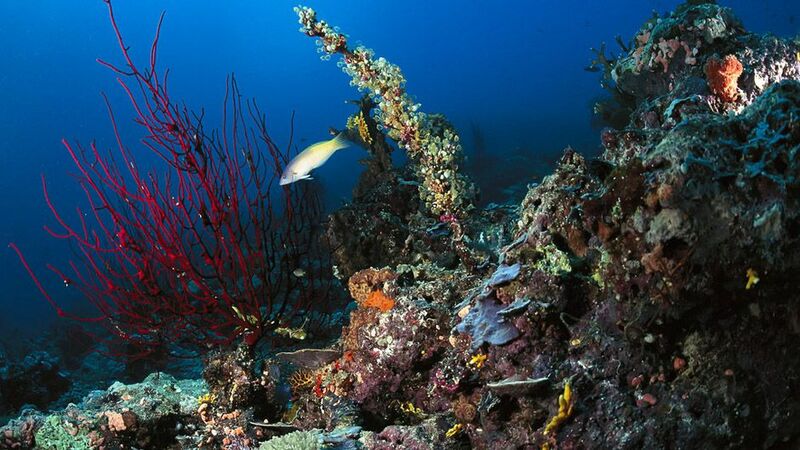 The region’s six nations banded together to partner in the Coral Triangle Initiative of Coral Reefs, Fisheries and Food Security (CTI-CFF) — MPAs now cover millions of hectares of the region. There’s currently an international spotlight on the importance of MPAs — they’re an integral part of the United Nations Environmental Program’s (UNEP) sustainable development goals. These goals realize the wellbeing of humankind and ecosystems are inextricably linked — this couldn’t be more evident than in the Coral Triangle — where one hundred and twenty million people work in fisheries. 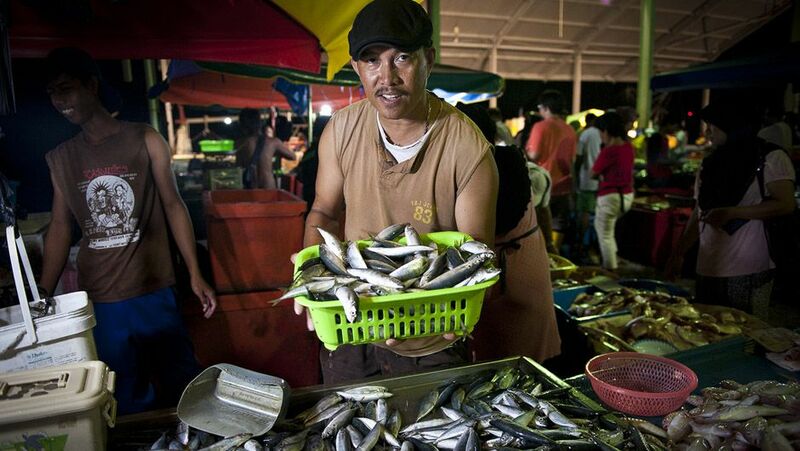 Fish traders in Kota Kinabalu, Malaysia recognize the importance of healthy oceans to their business and are working with government, community and USAID to reduce destructive fishing practices in the area. Photo: USAID CTSP/Tory Read. Creative Commons BY-NC (cropped). Both the UNEP and World Wildlife Fund (WWF) are calling for ten percent of coastal and marine ecosystems to be under protection by 2020 — right now it’s less than two percent globally. The WWF goes further claiming thirty percent must be off limits by 2030 for oceans to truly recover from the degradation associated with pollution and ocean acidification along with rampant overfishing. National Geographic Pristine Seas expedition leader, Paul Rose, says MPAs are a wise investment because healthy reefs that are not over-fished are more resilient to other threats — in the same way a healthy individual is able to fight off a cold or flu virus. Rose believes ecosystem stewardship such as a nation protecting its natural resources in MPAs, should be a bargaining chip in all global business transactions, because the healthy functioning of marine ecosystems is that vital. He has a point, when one considers that oceans cover seventy-one percent of the planet and are home to ninety-five percent of all biodiversity. They are the real World Bank — a bank so big that we could not survive its failure.